Hurricane Florence has made landfall in North Carolina, forcing a life-threatening storm surge of floodwater inland and shredding structures in its path. The storm’s maximum sustained winds held at about 90 mph, and it appeared that the north side of the eye was the most dangerous place to be as Florence moved ashore. A gust of 105 mph was recorded at Wilmington airport, surpassing the power of Hurricane Fran two decades ago. 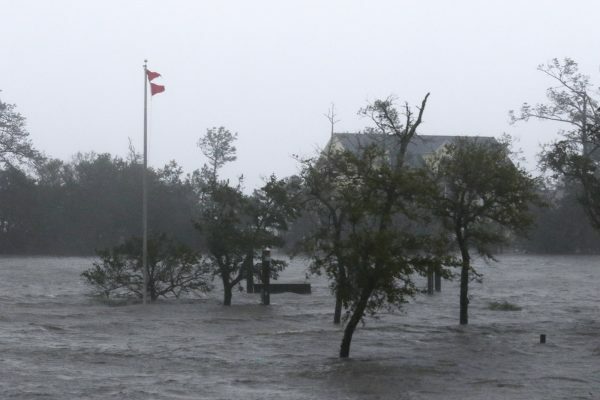 Authorities in the coastal city of New Bern, North Carolina, were working with responders to rescue at least 150 residents who reported being stranded in the hurricane’s surge, according to The Weather Channel. Nearly 200 people have already been rescued, according to Colleen Roberts, a city public information officer, Fox News reported. Craven County spokeswoman Amber Parker told ABC News that some people were trapped on their roofs. “I would say certain areas of New Bern are very desperate,” ABC reported. 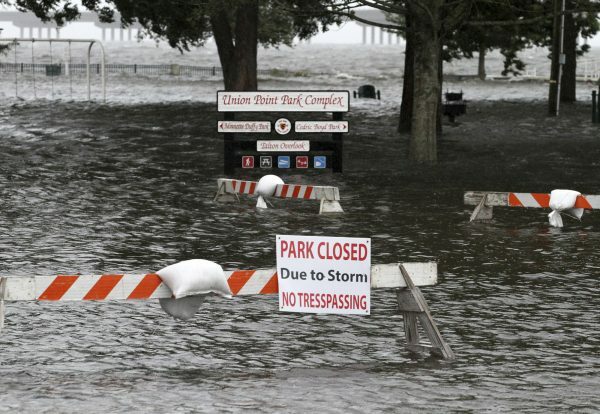 New Bern was one of the first cities affected by storm surge floodwaters after the Neuse River overflowed, flooding parts of the town. A gauge on the river had already recorded 10 feet of inundation, the National Hurricane Center (NHC) said. Reports have been received of major structural damage to homes and businesses in Onslow Country, according to The Weather Channel. Over 20 inches of rain had fallen on Emerald Isle and Atlantic Beach, both in Carteret County, by Friday morning. Hurricane Florence is set to inundate almost all of North Carolina in several feet of water, State Governor Roy Cooper told a news conference, while National Weather Service forecaster Brandon Locklear predicted up to eight months’ worth of rain in two or three days. Utility companies said millions were expected to lose power and its restoration could take weeks. 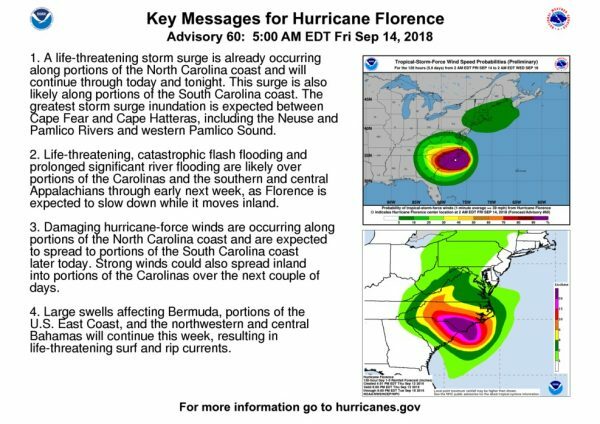 “A life-threatening storm surge is already occurring along portions of the North Carolina coast and will continue through today and tonight,” the NHC said in an alert posted at 5 a.m. EDT on Friday, Sept. 14. “This surge is also likely along portions of the South Carolina coast,” the warning continues. The NHC also warns of “life-threatening, catastrophic flash flooding and prolonged significant river flooding” through early next week. “Damaging hurricane-force winds are occurring along portions of the North Carolina coast and are expected to spread to portions of the South Carolina coast” later on Friday. 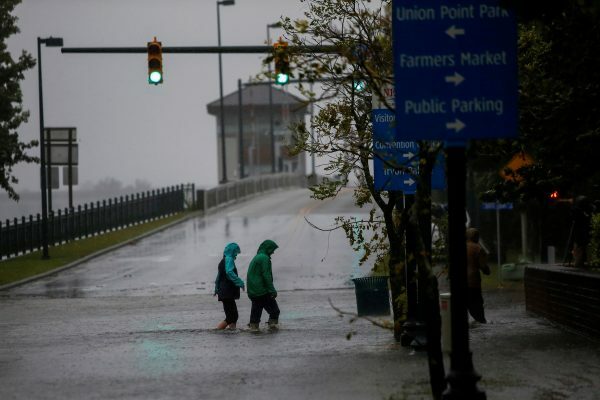 About 10 million people could be affected by the storm and more than a million were ordered to evacuate the coasts of the Carolinas and Virginia. 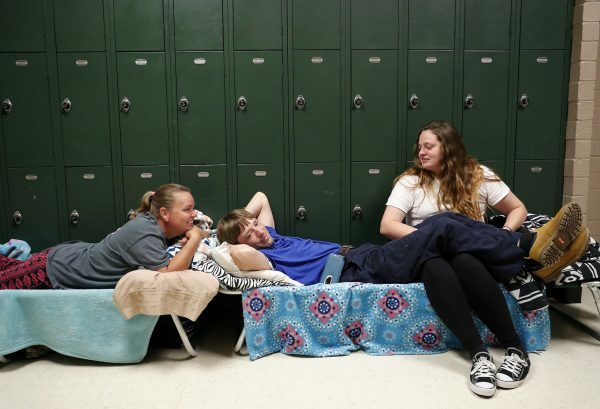 At least 12,000 people have taken refuge in 126 emergency shelters, Cooper said, with more facilities being opened. Emergency declarations were in force in Georgia, South and North Carolina, Virginia, Maryland, and the District of Columbia.